Iowa State ranks among the best in the world for agricultural programs. It ranks in the top 6 percent of 302 worldwide programs of agriculture and forestry programs by QS World University Rankings. Five consecutive years of record enrollment took place from fall 2012 to fall 2016. CALS leads the campus in retention and graduation rates. CALS has the third largest undergraduate student body among agricultural colleges in the nation. Multicultural undergraduate student enrollment has increased 54 percent over the past five years. International students for the spring 2018 semester come from 57 countries; 104 undergraduate students and 159 graduate students. More than 98 percent of CALS graduates in last year's survey reported they were working, continuing their education or serving in the military within six months of receiving their diplomas. Placement has been 97 percent or higher for 20 consecutive years. Nearly 65 percent of graduates stay in Iowa for their first jobs. CALS Career Services holds a career day in the fall and spring for students seeking internships or full-time positions. 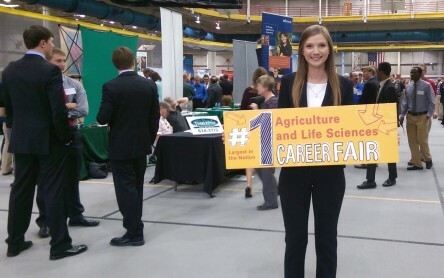 The fall CALS Career Day is the largest annual student job fair of its kind in the nation. $4 million in scholarships are offered to students annually through CALS and its departments. Iowa State has the nation’s #1 agricultural and biosystems engineering program for graduate students, according to US News & World Report. Nine faculty members have received national honors from the USDA Food and Agricultural Sciences Excellence in Teaching Awards. The college has 39 named faculty positions. CALS students won the American Farm Bureau Entrepreneur of the Year Award in 2015 and 2016. In 2017, two business ventures developed by CALS students were national semifinalists. CALS' Agricultural Entrepreneurship Initiative empowers undergraduates, faculty and staff with the entrepreneurial tools needed to start their own businesses. More than 300 students participate in events each year. CALS is a national leader in student participation in study-abroad programs, which take place on all seven continents. The 75th anniversary of the Ag 450 Farm, the only student-managed farm at a land-grant university in the U.S., was marked in 2018. Over the last five years, Experiment Station scientists successfully brought in more than $271 million in external funding to address critical needs and expand scientific frontiers. CALS has more than 45,000 alumni living around the world. In 2011-2012, alumni and friends gave more than $28 million to support students, faculty and programs. For more than 25 years, the George Washington Carver Summer Research Internship Program has promoted “science with practice” by exposing high school and undergraduate students, including many multicultural students, to research opportunities. CALS-led statewide initiatives were announced in 2017: the Iowa Pest Resistance Management Plan and the Iowa Monarch Conservation Strategy. Both are public-private partnerships involving farmers, businesses and communities to apply science to important issues impacting Iowa. CALS scientists also are partnering with the College of Veterinary Medicine to develop the Antimicrobial Resistance Consortium. CALS leads statewide research that is informing new practices and advances in water quality and nutrient management, through the Iowa Nutrient Research Center in support of the Iowa Nutrient Reduction Strategy. More than 130 Iowa State faculty members use the CALS' research farms around the state for teaching, research and extension. A similar number of staff members are involved as project leaders and workers. About 660 research projects are underway at the 13 farms. About 15,000 people visit the research and demonstration farms every year. 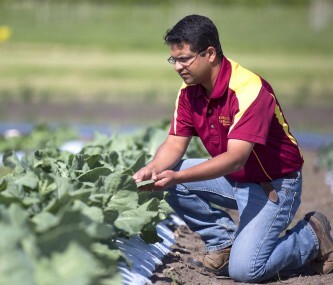 Eighty percent of Iowa State University’s 377 active license and option agreements are linked to CALS and Agriculture Experiment Station research. Agriculture and Natural Resources Extension programming annually reaches more than 195,966 Iowans through educational events and field days, and more than 6.7 million visitors through its websites.